As rumored, Apple Pay went live for Italian customers on Wednesday local time with initial support from Carrefour, UniCredit and prepaid card marketed by Boon, bringing the service to its 16th market. Though an official announcement has yet to reach Apple's regional Apple Pay website, users are reporting immediate availability via Twitter. Apple is sending out notifications urging iOS, watchOS and macOS device owners to provision their Visa or Mastercard credit and debit cards with the service. The launch comes just hours after a report citing bank officials said Apple would roll out services on Wednesday. In Italy, Apple Pay is launching with support for Carrefour bank and UniCredit, as well as Boon prepay. Boon is a European service and smartphone app that allows customers to conduct transactions at point of sale terminals that accept Mastercard contactless payments. The system, which is integrated with Apple Pay as a card issuer, requires a prepaid Mastercard to work. The arrival of Apple Pay in Italy continues Apple's international rollout effort which began with a U.S. introduction in 2014. The service has since expanded to Australia, Canada, China, France, Hong Kong, Ireland, Japan, New Zealand, Russia, Singapore, Spain, Switzerland Taiwan and the U.K. 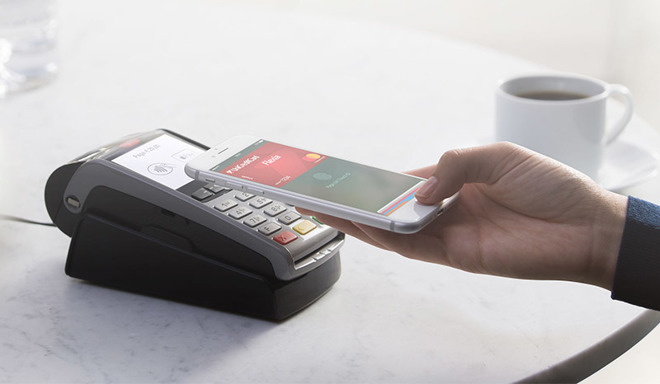 Most recently, Taiwan gained access to Apple Pay in March with support from seven banks. That same month saw a start of services in Ireland. While Apple has not revealed future plans for Apple Pay, circumstantial evidence suggests Germany might be Apple's next launch region. Earlier this month, however, reports claimed Apple faces a tough road ahead in the major European market, as German banks are not eager to give up revenue from Apple's required transaction fees. Further, Germany is for the most part a cash-based economy, meaning consumers will need to be retrained if Apple hopes to garner wide adoption.